Next stop: Ethiopia. Who says you can’t play with your food? 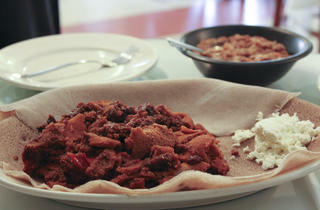 The best brunch in LA for feast-with-your-hands Ethiopian dishes are at this must-try Fairfax District restaurant. This stretch of Fairfax Ave is the heart of L.A.’s Ethiopian community, where locals pop in and out of the shops and restaurants, catching up on gossip. Breakfast is an afternoon affair—most restaurants on the block don’t open until 11 am—perfect for the late-riser or the ambitious traveler who’s already made an early-morning visit to nearby LACMA. 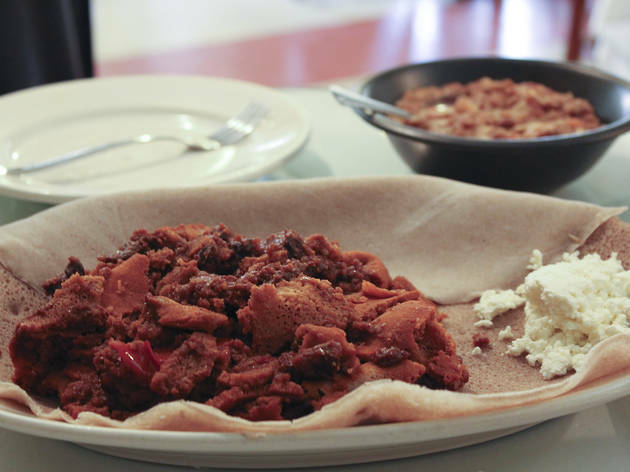 Once Little Ethiopia opens its doors, head in for a hearty bowl of fool (a spiced bean and vegetable stew) ($12) or a platter of quanta firfir (dried beef sautéed with pieces of injera) ($9). The Ethiopian coffee ritual rivals the Japanese tea ceremony in complexity and tradition—you can opt for a simple, well-brewed cup here or, fortified by fool, you can cross the street to Messob for the full ceremony. Hours: Tue-Thu 11am-9pm; Fri, Sat 11am-10pm.